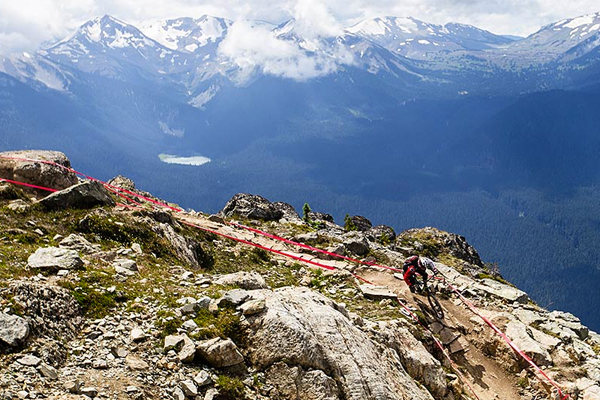 This weekend sees the SRAM Canadian Open Enduro Presented by Specialized land in Whistler for round six of the Enduro World Series, part of the Crankworx Festival. This year’s course has a very different feel to last year’s race - gruelling climbs have been replaced by chairlifts and the emphasis is very much on the stages at this year’s event. The riders will face five stages in one day, with only one of the liaisons tackled on the bike. In the men’s race all eyes will be on series leader Justin Leov, who has just a 40 point lead over closest rival, second placed Florian Nicolai. And only ten points behind him is Richie Rude, who won his first race just a few weeks ago in Samoens. But the man to beat could well be Jared Graves, who took the win here in 2014 in spectacular style and appears fully recovered from the shoulder injury that forced him out of the first three rounds of the series. In the women’s race Tracy Moseley continues to dominate, and with main rival Anne Caroline Chausson out of action due to illness, she has a comfortable points lead. However, Cecile Ravanel took the win in Whistler last year and has been on the podium at every race so far this season - and can’t be discounted from doing the same again. Also hot on Tracy’s heels will be Anneke Beerten - sitting third in the overall competition she has been consistent all year and will be pushing hard for a top three finish. And there’s also some new faces to look out for in this year’s race - no less than five of slope style’s biggest names will be included in the start list. Cam Zink, Kyle Strait, Ryan Howard, Greg Watts and Mikey Silvestri will race the enduro as a team, taking on a stage each. It’s the first time anyone has raced as a relay team and it will be interesting to see if any of them can trouble the top men’s times. Darren Kinnaird, Crankworx General Manager said: “We’ve really mixed things up this year. The racing is all about the stages and this year’s trails are amazing. There’s some pretty steep and technical tracks in there, so although there is less emphasis on the liaisons it’s by no means an easy course. We expect the times of the top racers to be incredibly close which always makes for the most exciting racing." Following last weekend’s tragic accident in Crested Butte, riders will wear stickers with the number 139 in memory of Will Olson - his race number during last week’s event. The number 139 has now been taken out of circulation and will never be issued to another Enduro World Series rider.